Fariba Kamalabadi, 47, who had been serving in a voluntary capacity on an Iranian Baha'i body known as the Yaran (The friends) since 2006, was detained at her home on May 14, 2008, and then taken to Tehran's Evin Prison. 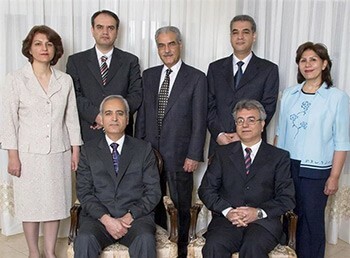 Simultaneously, five of her colleagues on the Yaran were also arrested and taken to Evin while a sixth had previously been arrested in Mashhad on March 6, 2008. Amnesty International recognizes all seven as prisoners of conscience. After Kamalabadi endured months of incommunicado detention, mistreatment, and denial of heart medication, Tehran's deputy prosecutor general for security affairs, Hasan Haddad, announced on February 11, 2009, that the seven would be tried on charges of espionage for Israel, insulting religious sanctities, and propaganda against the Islamic Republic of Iran. Then, in response to an announcement by Iranian attorney general Ayatollah Qorban-'Ali Dorri-Najafabadi that all Baha'i establishments run counter to Iranian constitutional law, the Baha'i community in March 2009 disbanded the Yaran and all other Baha'i organizations in Iran. Dorri-Najafabadi further announced that the very declaration of Baha'i belief is illegal. The government requires Baha'is to declare their religion—for example when registering births, seeking inheritance, applying for business licenses, or registering for school—so this declaration puts Baha'is in a situation of having to engage in illegal activity. When the Yaran was operational—with the full knowledge and tacit agreement of the Iranian authorities—it was recognized by Iran's three hundred thousand Baha'is as their informal organizational body. Since Baha'is do not have a clerical religious structure, this body handled all community needs. Kamalabadi is not new to religious discrimination. She had wanted to follow in her father's footsteps and become a physician, but university entrance was denied her in the early 1980s on religious grounds—no Baha'i has completed university studies since then. When the Baha'i community in Iran established the Baha'i Institute for Higher Education in 1987, Kamalabadi was among the first group of students to graduate and later completed her postgraduate degree in education, specializing in developmental psychology. Kamalabadi faced arrest twice in 2005: first in a raid at her home by officers of the Iranian Ministry of Intelligence on May 25, 2005, after which she was held for thirty-five days, twenty-two of which she spent in solitary confinement. Later that year, she was seized while traveling and detained in Mashhad and later Evin Prison, spending nearly two months in solitary confinement. During her period of captivity since 2008, Kamalabadi has only been afforded a handful of visits with her family and has been denied access to her lawyer, Nobel laureate Shirin Ebadi. While Kamalabadi is not alone in the battle for free expression in Iran, she has become a symbol for those seeking religious freedom and the right to say who they are and for what they stand. Vargha Taefi, the son of Fariba Kamalabadi, has studied at the Baha'i Institute of Higher Education and at the University of Leicester; he is currently a Ph.D. candidate at the University of Warwick. Nazila Ghanea is a lecturer in international human rights law at the University of Oxford and editor-in-chief of the international journal of Religion and Human Rights. Amnesty International, May 15, 2008, Aug. 6, 2008, Feb. 12, 2009. Radio Free Europe, Feb. 17, 2009. Press TV (Tehran), Feb. 15, 2009. Journalist Club, Feb. 19, 2009; Baha'i International Community to Ayatollah Qorban-Ali Dorri-Najafabadi, attorney general, Islamic Republic of Iran, Mar. 4, 2009; Baha'i World News Service, Mar. 6, 2009; Iran Press Watch, Mar. 12, 2009. Related Topics: Iran | Summer 2009 MEQ receive the latest by email: subscribe to the free mef mailing list This text may be reposted or forwarded so long as it is presented as an integral whole with complete and accurate information provided about its author, date, place of publication, and original URL.